Tumblr Joins Flickr Inside Yahoo, But Where Is the Money? Flickr has announced an upgrade to its service just hours after its owner, Yahoo, announced it is also buying Tumblr. Flickr is in fact getting "biggr," now offering a free terabyte of storage space for photos and videos. From the company announcement: "Just how big is a terabyte? Well, you could take a photo every hour for 40 years without filling one." Yahoo’s acquisition of Tumblr for $1.1 billion is the latest of many attempts over the past two decades by established Internet companies to keep up with technology trends and user behaviors that continue to shift and evolve. The main question for a publicly traded company like Yahoo is how to turn Tumblr into a revenue producer that contributes to its bottom line. Tumblr is best known as a microblogging and social networking service that facilitates creative multimedia postings. As of today, the site boasts 108.7 million blogs and 50.9 billion posts, and launches about 900 new posts per second. Flickr was the first hot photo-sharing site until it was acquired by Yahoo back in 2005. 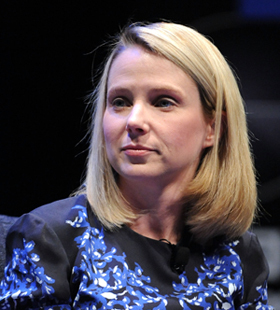 For many years, until Marissa Mayer took over as Yahoo’s CEO last year, Flickr languished inside the Internet giant, largely ignored while feisty startups like Instagram (acquired by Facebook a year ago) and Tumblr emerged as more innovative media‑sharing services. In the process, Flickr seemingly missed opportunities with the explosions in social media and mobile devices. But Flickr released an impressive new iPhone app last December, among other recent upgrades, and during a visit to Yahoo’s downtown San Francisco office last month, I asked Flickr executives about how things have changed since Mayer took the helm at Yahoo. “Marissa is hugely supportive of Flickr,” said Brett Wayn, VP and general manager at Flickr. Wayn described Flickr’s current business model as harvesting four revenue streams: subscription fees (for “pro” accounts), advertising, a photo licensing deal with Getty Images, and a photo print partnership. Mayer herself promised earlier today in a conference call with analysts to not “screw up” Tumblr, asserting it will be allowed to continuing operating as separate operation. But she also indicated that monetizing Tumblr content will be a priority—raising the prospect of advertisements that many Tumblr users might not welcome. That type of controversy is reminiscent of Google’s purchase of YouTube 2006. YouTube generated little revenue for years until the search giant figured out ways to insert ads at the front of videos, and started sharing that revenue with video content creators.